This morning we start the really neat stuff. We'll be going IFR to Martha's Vineyard on the first segment of a three-airport round robin. 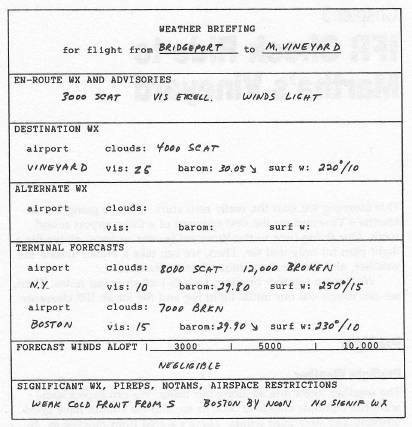 Our flying time to the Vineyard is over an hour, so we file a flight plan for only that far. Then, we can take a break, update the weather, and file for the continuation to Hartford. We have a weather briefing, so let's look over our notes. Then, we can rough out our initial flight log and file for an IFR clearance. The weather looks fine all along our route. We can expect some scattered cumulus clouds at 3000 or so, and we should have good visibility and very light winds. There's a cold front moving in, although it's weak, and no significant weather is expected with the front. Forecasts suggest we may have a broken or overcast layer later on, but it should be up around 8000 or so, so we'll probably remain below it. Of course, we also know everything can change unexpectedly. For the first leg, plan to proceed directly from Bridgeport to the Madison VOR. 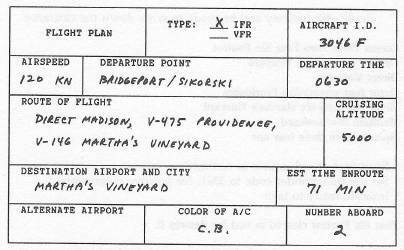 From Madison, however, we can plan a route to Martha's Vineyard (MVA) that follows the Victor Airways. We might as well plan for a logical Victor Airway route since ATC most likely will be giving us an Airway route anyway upon clearance. Figure on following Victor 475 from Madison through Norwich to Providence, and then Victor 146 from Providence to MVA. Our checkpoints, therefore, are the Madison, Norwich, Providence, and MVA VORs. Bear in mind that this time, except for the first leg to Madison, we aren't simply homing on the VORs as we did before. Rather, this time we're following Airways, so on each leg we have to track a specified radial from one VOR to the next. ATC monitors us on radar, and if we stray from the specified radial, the controller informs us we're off course. Are the instrument panel lights on? Reply affirmatively and be ready to write down the clearance. Read back the clearance to confirm. Set the transponder code to 3341, for positive radar contact. While taxiing, get ahead: Set Nav 1 to 110.40, for Madison. Set Nav 1 bearing to approximately 080 degrees. Acknowledge and switch to 120.9. They're expecting us. Note the time and takeoff when ready. After liftoff, maintain the runway heading. Acknowledge, switch to 126.95, and contact Approach. Check Nav 1: Are you set for Madison? Toggle the Nav 1 OBS to center the needle. Be sure the flag reads TO. Note the bearing, turn to that heading, and home on the VOR. What's our ETA at Madison? Get ahead: Nav 2 on Madison, outbound bearing 078—a reminder. Keep rechecking what you've already done. Don't chase the needle—just hold your inbound heading. Toggle Nav 1 to 078 degrees, the outbound radial. Note the time and record it as our ATA at Madison. Turn to 078 degrees, the outbound heading. Check Nav 1: Is it on Madison R-078? Turn as required to center the needle. We're not homing now: Stay on R-078. Figure out our ETA at Norwich and enter it on the log. Recheck the things you've already done. Set Nav 2 the same as Nav 1, as reference/backup. Leave Nav 1 bearing on 078 degrees. Switch Nav 1 to 110.00, for Norwich. Turn as required to recenter the needle. Track R-078 inbound to Norwich. Recheck what you've already done. Four Six Foxtrot Boston Center on one one three point two so long. Consider what you have to do at Norwich. What's the outbound heading from Norwich? Is it set up on Nav 2? Toggle Nav 1 to 082 degrees, the outbound radial. Note the time and record it as our ATA at Norwich. Turn to 082 degrees, the outbound heading. Check Nav 1: On Norwich R-082? Figure out our ETA at Providence and enter it on the log. Leave Nav 1 bearing at 082 degrees, the Airway radial. Switch Nav 1 to 115.60, for Providence. Prepare for station passage and a new outbound heading. Prepare to start your turn to 132 degrees at about one mile DME. Leave Nav 1 on Providence, R-132, and center the needle. It's almost 50 miles to Martha's Vineyard. If you wish, set Nav 2 to 115.6, for Whitman, to monitor our progress. Periodically toggle the Nav 2 bearing to center the needle. Note the bearing and consult the chart for our position. Set Nav 2 the same as Nav 1. Leave the Nav 1 bearing set to 132 degrees. 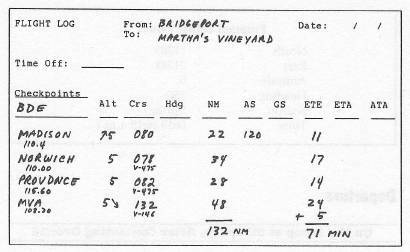 Switch Nav 1 to 108.20 for Martha's Vineyard. If necessary, make turns to recenter the needle. Contact Otis Approach on one twenty-four point seven bye. Descend and maintain three thousand. Just ease back a bit on the power. Pull out the approach plate and begin to study it. Contact Tower on one twenty-one point four so long. Heading zero five six degrees. Visualize how they're routing us relative to the airport. The airport is about eight miles away to our right. We're now on a kind of long, wide downwind leg for Runway 24. When we're well past the airport, they'll have us turn right. Now we're on a kind of long, wide base leg. On that leg, they'll turn you loose to intercept the localizer. Better slow down and get the airplane set up for the approach. Localizer frequency is 108.70. Inbound course is 236 degrees. Hmm…look at the stuff that's drifting in from offshore. Is Nav 1 on 108.70, the localizer frequency; OBS on 236 degrees? Monitor the Nav 1 needle. As it moves to center, start a gentle right turn to 236 degrees. Try to arrive on heading 236 degrees just as the needle centers. Make gentle turns (one or two degrees) to keep the needle centered. Monitor the glide slope indicator and DME. The glide slope needle should center at Borst—about 6.8 miles DME. As the glide slope needle approaches center, gradually throttle back. Use the throttle gently to stay on the glide slope. At the middle marker, the panel indicator flashes and beeps. Put your landing gear down (if retractable) when the runway is in sight. Ground on one twenty-one point eight later. Turn off the runway and contact Ground. You're cleared to taxi to the gas pumps. In order to regulate the flow of traffic to and from an airport, ATC often provides radar vectors. That is, the controller monitors the aircraft's progress on the radar screen and gives the pilot specific compass headings to fly—just as an instructor sitting next to you in the right-hand seat might do. Also, the controller usually briefly tells about such vectors so you'll know what's going on and where you're headed. The Victor Airways are something like the Interstate Highway System except you can't actually see them. They're simply a set of established routes marked on aeronautical charts, running from one VOR to another. The charts in this book show many of these Airways. For example, the Airway labeled V-475 runs from Bridge-port through the Madison VOR and on through Norwich. To file a flight plan, the pilot usually fills out a standard flight plan form, telephones Flight Service, and reads out each of the items in turn. A slightly modified form is used for the flight plans in this book. When you file an IFR flight plan, you're requesting an IFR clearance for that flight—you're asking ATC to protect certain blocks of airspace for you so you can proceed on the flight regardless of clouds and visibility. Usually, you receive the actual clearance itself by radio from Ground Control when you're in the cockpit and ready to go. (Some busy airports have a separate Clearance Delivery Frequency for this purpose.) Ground asks if you're ready to copy and then reads the clearance, which you in turn read back to ensure you have it right. The actual clearance may provide the same routing and altitude you've requested, or the routing and/or altitude may differ depending on weather and traffic conditions. If you accept the clearance, you enter into a contract with ATC. ATC protects the specified airspace from other IFR traffic, but you must adhere to the clearance routing and altitudes (and you must still watch out for VFR traffic when you're not flying in the clouds). For IFR flights below 18,000 feet, En-Route Low Altitude charts are used. These show VORs, Airways, beacons, and various other items relevant for radio navigation, but they show little if anything of the earth's geographic features one finds on most other maps. 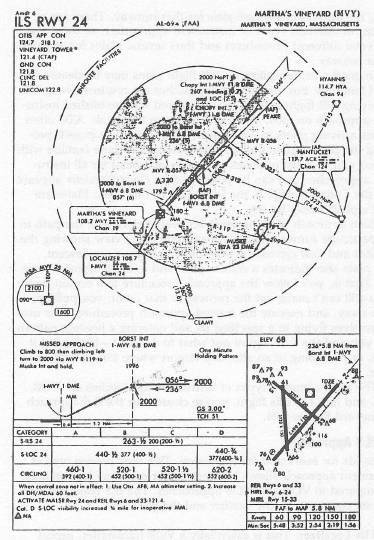 The charts in this book, provided to assist you in flight planning and navigation, are simplified facsimiles of these En-Route Low Altitude charts. In order to permit landings under conditions of low ceilings and/or poor visibility, the government publishes instrument approach procedures for a large number of individual airport runways. The procedure for any given runway is described in detail in a separate chart, the instrument approach plate for that runway. There are a number of different types of instrument approaches, so there may be several different procedures and thus several plates for any particular runway. In good weather, pilots on IFR flight plans may be cleared for visual landings, but instrument approaches are routinely assigned to arriving IFR flights. Thus, you're cleared for a published instrument approach on most of the IFR flights in this book. ATC often advises arriving pilots in advance which approach to expect, providing the pilot time to pull out the plate and become familiar with the procedure. A list of plates (and page numbers) for all instrument approaches that can be performed on Flight Simulator appears after the Contents page in the beginning of this book. Plates are listed alphabetically by city. Each approach plate provides an overhead view of the path to that particular runway, including a profile (side) view showing the altitudes and final approach fix—where you begin your descent. Each plate also indicates a decision point and a missed-approach procedure. That is, you follow the approach procedure to a certain point; if you still can't make out the runway at that point, you pull up, climb away, and execute the missed-approach procedure. This usually involves flying to a specified fix and entering a holding pattern until you and the ATC figure out what to do next—like trying it again, or just going to an alternate airport where things might be better. The most common types of instrument approaches are VOR, NDB, and ILS. On this flight, you're cleared for the ILS approach to Vineyard Runway 24. ILS stands for instrument landing system. This very precise type of instrument approach allows landings under relatively low ceilings, as compared to VOR and NDB approaches. The ILS really has two separate components: the localizer and the glide slope. The Localizer. This is essentially a VOR transmitter, except that it has only one very sensitive radial. If you tune Nav 1 to the localizer frequency and keep the Nav 1 needle centered as you descend, you stay lined up with the runway in a left-and-right sense. If the needle drifts from center, very gentle turns (two degrees or so) usually recenter it. When Nav 1 is on the localizer frequency, it makes no difference how you set the OBS; however, good practice is to set it to the inbound localizer course just as a reminder. Glide Slope. This is like a localizer turned on its side. The glide slope needle in the Nav 1 window is horizontal, so when it's centered it forms a cross with the localizer needle. If you keep the glide slope indicator centered in the window as you descend, you'll stay on the glide path to the runway in an up-and-down sense. You usually keep the needle centered by adjusting RPM. For example, if the needle is below center, you're above the glide path and you need to both ease back a little on the power and monitor the needle. Use a gentle touch, be observant, and be patient. ILS Entry Procedure. If you're to be cleared for an ILS approach, Approach Control usually vectors you onto a heading that will let you intercept the localizer in the same way you would intercept any other VOR radial. You set Nav 1 to the localizer frequency and set the Nav 1 bearing to the inbound heading—just as a reminder. As the needle moves to center, you begin a gradual turn onto the localizer heading, trying to arrive on that inbound heading just as the needle centers. Descent. You're vectored to intercept the localizer at a point well before the final approach fix—the point at which you begin your descent. In other words, when you intercept the localizer, the glide slope is above you, so the indicator needle is at the top of the Nav 1 window. As you proceed inbound, the needle begins to move down toward center. As it does, start to ease back very gradually on the power and adjust the power as necessary to keep the needle centered while you descend. Use a light touch. If you're heavy handed, your passengers will think they've boarded a roller coaster instead of an airplane.